UNU-MERIT » Mobility in the European Union: What don’t we know? For many Europeans, mobility within the European Union is such an inherent part of everyday life that the availability of precise statistics on these movements may seem like a given. However, a new data-mapping exercise conducted as part of the REMINDER project has revealed that our understanding of intra-EU migration is still far from complete: even basic stock and flow statistics on internal European movements suffer from considerable shortcomings: existing data does not reveal who is moving, why, and why to that specific country. In this post, we highlight three of the key challenges we experienced in gathering data on intra-EU mobility. A first dilemma we came across relates to definitions, namely: who do we consider an intra-EU mover? The three main categories of immigrant individuals in EU countries who tend to be captured as ‘intra-EU’ migrants: immigrants who are EU citizens, those born in another EU country, and those who used to reside in another EU country. 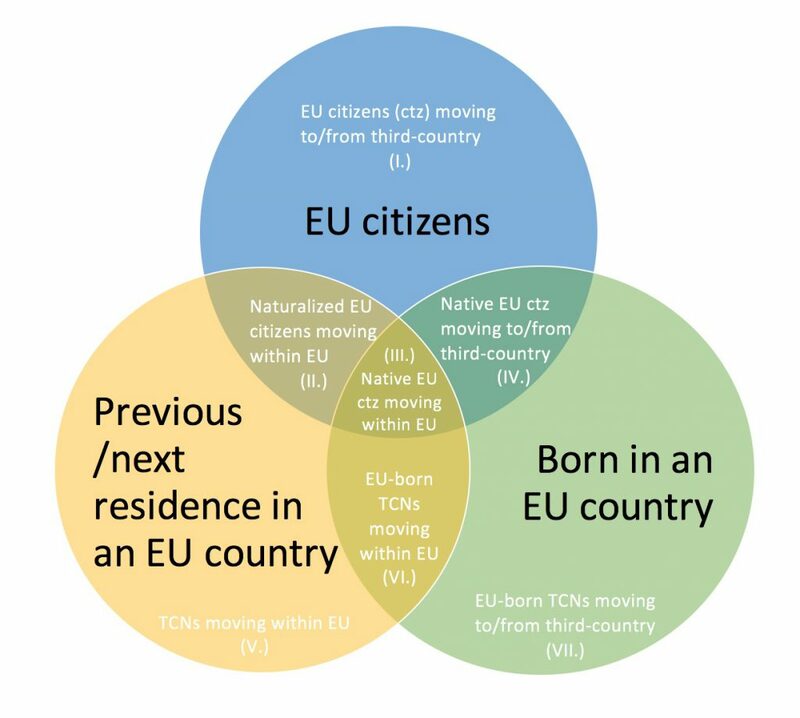 As indicated by the white text in and outside the intersections of the circles, each of these three categories may refer to four separate groups with regards to the EU origins of their members. If we really are only interested in movements taking part within the EU’s territory, we must recognise the role of secondary movements: EU nationals (and EU-born individuals) may have moved to a non-EU country before their migration to a foreign Member State from outside the EU, and people of non-EU origins may perform additional movements within the EU. If we solely base our definition on citizenship or country of birth, we may erroneously include the former group and exclude the latter. Information on migrants’ previous country of residence is therefore a crucial first step to capture the real scope of movements happening within the EU. What about serial movers / mobility over the lifetime? The issue of secondary movements brings us to the next major gap: the lack of information on extended migration trajectories. The overwhelming majority of currently available migration statistics track only the migrant’s latest movement (at the time). Even surveys provide little information on repeated migration episodes over people’s lifetime; at best, we have information on returnees. This omission reflects a simplified view of migratory behaviour, which in real life can follow a variety of non-linear patterns, such as onward migration, re-migration following return, as well as seasonal or other forms of circular migration. Knowing more about non-linear migration patterns could help us better understand the real nature of European mobility and learning about individuals’ migration histories could help gauge the degree to which previous movements may predict future movements. For instance, experiences of previous migrations to a country may influence future migration decisions: even a short-term move within the framework of the Erasmus university exchange programme can spark an aspiration to migrate to the country permanently, and/or develop an openness to the migration experience in general. In addition to mapping databases, our team also performed a comprehensive review of the empirical literature discussing the drivers of intra-EU movements in the past decade. The lack of residence permit requirements within the EU – the most common information source on nature of movements – means that cross-national data on individual’s reasons for moving between Member States is severely limited and is largely based on a few selected surveys. Generally speaking, we gather from existing research that the motives of mobile Europeans are highly diverse, but work and personal relationships are clearly the two main driving factors. Work-related factors include employment, higher wages, career prospects and working conditions. Motivations tied to personal relationships involve familial as well as romantic relationships. While work and personal relationships are typically the two most often indicated motives for both males and females, their relative popularity within gender groups reveals the persistence of a traditional gender divide, with work being predominant for males, and family (or personal relationships) being predominant for women. Regarding geographical differences, income differentials elicit nationals from the new member states more often than EU15 nationals, who are likely to put more weight on career development, family motivations, or new experiences when deciding to move. In connection to the latter, some recently emerging factors beyond the ‘classic’ drivers of work and family include lifestyle considerations include, for example, the environment, culture, and climate, and motives related to personal development, and self-fulfilment. Education and asylum-related migration represent only a very small part of long-term intra-EU movements, but, as mentioned above, short-term study mobility can trigger longer-term moves in the future. Some further limitations in our understanding of what drives intra-EU mobility stem from the limited topical and geographical focus of the existing literature. When it comes to fully understanding intra-European mobility, we still have a surprisingly long way to go. Some key priorities we argue for include better data collection and sharing, concerning in particular residence-based immigration data, availability of multiple disaggregations, and collection of information on migration history. 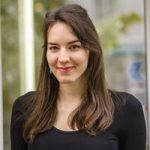 Concerning research on the drivers of intra-EU mobility, data sources could be improved as well, but it is also important that researchers expand the focus of their studies beyond the most highly politicised aspects of intra-EU migration as to better reflect the real unanswered questions. A longer version of this article was originally posted on the REMINDER project website. Read the full article, including references, here. Read the full paper, which maps existing data sources, here. Veronika Fajth is an education and research officer at UNU-MERIT/MGSoG. Her main areas of interest are migrant integration, social inclusion, and migration statistics. She holds a holds a Master’s degree in Public Policy and Human Development and joined the Migration Research Group in September 2016.